How can you keep your left arm straight during a golf swing and this is a question that a lot of golfers ask me, because it’s probably one of the most noticeable things, they see the best players in the world doing when they’re watching the TV. Most good players at the top of their backswing would have their left arm in quite a straight position here and that provides an awful lot of consistency on the way down. Now it’s not essential you keep your left arm straight, there are some good players that have a little bend through the left arm or through their front arm if you’re a left-handed golfer, but for most club golfers, they would probably find a high degree of consistency if they did have the left arm straight. 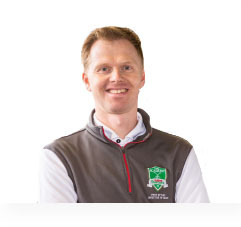 So we’ve got your left arm straight to set-up, we’d like to have your left arm straight back and your left arm straight at impact and you’ll probably find more vertical consistency so you wouldn’t be too high, you wouldn’t be too low, the club would come back down and strike the ball quite neatly every time. So keeping that left arm straight can be quite difficult for a lot of golfers, because they lack the physical flexibility as they turn back here it starts to get a bit tight around the chest so the arms starts to buckle and bend, then they end up looking at the club and say, “When the club is in a good position doesn’t that count?” But really with the big bow through the left arm, they could struggle to get consistency on the way down to impact. So we really want to make sure the left arm is straight to start with, as you pull that left arm round, you stretch it up to the skies as much as you can, now you can hear my voice, that’s quite tight to hold that position, but my glove is pushed away from me, my left arm is straight and I’ve achieved that by also making quite a big shoulder rotation. If this left shoulder doesn’t come around very far and my left arm comes back that’s really difficult to do and already my arm starts to bend. If I can turn my shoulders more, my left arm can come up straighter and that’s a good position. Now, the left arm doesn’t necessarily need to be locked, we don’t want to stiffen that left arm out too much. It needs to keep in a relaxed position, that’s relaxed but straight and locking it isn’t necessarily what we want to achieve. Now you could also do some stretching exercises to help with your left arm flexibility. Simply place your left arm forwards, pull it all the way across your chest and then grab the back of the elbow and pull the elbow across your chest, that provides more flexibility through the shoulder so that then when you swing to the top, stretching that left arm to the sky feels easier and return that left arm down straight to the back of the ball and I think by keeping your left arm straight you’ll get more consistent golf shots.